In the 1980s, more than 3.5 million people contracted guinea worm disease (GWD), a parasitic infection spread through drinking water. But by 2014, that number was down to 126. Last year, only 22 people developed GWD, and so far this year, there have only been two confirmed cases, in Chad. Two. If this trend continues, by next year GWD could become the second ever human disease to be completely eradicated, NPR reports. 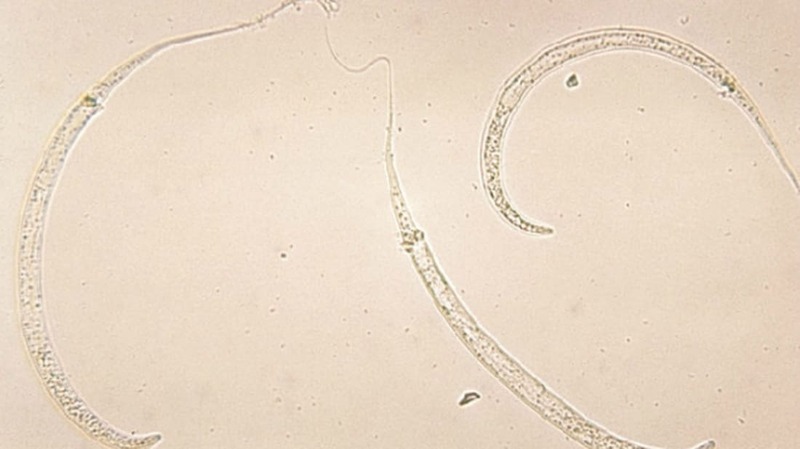 With the possible exception of helminth therapy, parasite infection is often harmful. Guinea worms (Dracunculus medinensis) start out as small larvae in a body of water. If that water isn’t filtered before someone drinks it, those larvae can enter a person’s body. Once inside the body, they quickly grow, reaching lengths of up to 3 feet before attempting to exit the body via a large blister. Like so many parasites, D. medinensis has a way of getting its host to help advance its spread; blisters are often hot to the touch, which drives infected people to submerge their limbs in water. Once in the water, the parasite can release its larvae, and the whole process starts all over again. Infection with D. medinensis in itself isn’t fatal, but it can be incredibly painful. There is no vaccine to prevent GWD, and no medication to treat infection, so once the parasite has taken hold, the only way to rid someone of the worm to pull it out—a gruesome process that, in rural areas, can lead to more pain and infected wounds. Fortunately, there’s a fairly simple solution: filtered water (even pouring it through a piece of cloth can help), and staying away from water in which infected people have been bathing. But spreading the word about those preventive measures has been tricky, as the last holdouts of GWD territory are rural areas and villages with little access to resources. Public health officials, who are typically outsiders who don’t speak the local language, have had a hard time finding a foothold to pass the message along. But in recent years, a combination of local education about how the disease spreads, new laws intended to keep infected people from entering a water source, and consequences for breaking those laws have made a huge dent in the number of cases. The fight against GWD was taken up decades ago by a powerful ally: Jimmy Carter. The former president has made GWD eradication, and disease eradication in general, a major priority for his Carter Center.